Download the server mod LoginMessage (v0.4) for Forge Server. This can be found on the Rei's map download page under the section "How to enable Cave maping / entities radar on SMP". Download the Forge Server version corrosponding to the current version of FTB that you are running (1.4.6). Place the downloaded zip file in your server's Mods folder. Run the server once to create a file called "LoginMessage.txt". 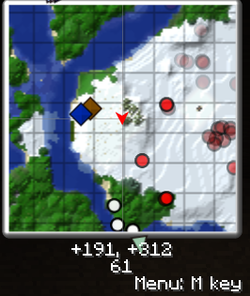 Waypoints in Mystcraft dimensions are lost when logging out and back into Minecraft. Some modded blocks (Block Breakers and Solar Panels from RedPower 2 etc.) show up as purple on the minimap. This page was last modified on 19 May 2016, at 21:14.